The Women’s Storybook Project of Texas is an Austin nonprofit that encourages incarcerated mothers to read to their children. A Texas nonprofit connects incarcerated mothers with their children through reading. The library is decorated with inspirational posters, so many that their cumulative effect is almost aggressively cheerful. “Reading is a HOOT!” proclaims one, a flock of cartoon paper owls tacked up alongside it on the white cinderblock wall. In bright primary colors, other posters extol the virtues of creativity, initiative and the Dewey decimal system. It’s an overcast afternoon in March, with storm clouds gathering outside. Still, natural light streams in through a large window, falling onto the tables where Crystal Montelongo is arranging children’s books. Montelongo, 28, is an inmate at the Mountain View Unit, a women’s prison in Gatesville. She’s also a participant and mentor in the Women’s Storybook Project of Texas, an Austin nonprofit that encourages incarcerated mothers to read to their children. Volunteers record the women as they read; later, they mail a CD and the book to the child so he or she can listen and follow along anytime. A guard frisks Sybil McGlothlin, whose daughter was born during her incarceration, before entering the library at Mountain View Unit in Gatesville. Clockwise from top: A guard frisks Sybil McGlothlin, whose daughter was born during her incarceration, before she enters the prison library; Judith Dullnig, founder of the Women's Storybook Project, explains the recording process to the women as they choose their books; Tashima Everhart chooses books for her two daughters. She says her 4-year-old started calling her "mama" for the first time after listening to the recordings. Dullnig was inspired by a similar project in Louisville, Kentucky, called Aunt Jane’s Storybook, which she heard about from friends there. “It took me about a year to figure out how I was going to do it,” she says, enlisting friends from her Episcopal church as the first volunteers. Similar projects exist around the country, but the Texas nonprofit has grown to be the largest, and one of only a few that aren’t faith-based. (The organization frequently turns down donations of religious books). The biggest challenge came when volunteers upgraded from recording on cassette tapes to using USB recorders and burning CDs on laptops, which are banned from prisons. Once the group demonstrated that its computers couldn’t connect to the internet, Texas Department of Criminal Justice authorities relented. Other than the laptops and USB recorders, the nonprofit costs very little to operate; all the books are donated. Some 65,600 mothers are incarcerated nationwide, a 131-percent increase since 1991. She moved from Rhode Island to Vermont to live with her aunt and uncle. After earning a teaching degree at the University of Texas at Austin, she married Jon Dullnig, a Naval officer who later worked as a petroleum inspector. His career took them to Aruba, Chicago, Atlanta, New York and eventually back to Austin. Dullnig raised two children and worked as a sous chef at a writer’s retreat and a substitute teacher. All the while, she volunteered with church groups and nonprofits — a habit she says she inherited from her grandfather. “When I was a little girl, he’d bring me with him to nursing homes, where he’d go to drop off flowers for the residents,” she says. Prison is the main industry in Gatesville, home to five of the state’s 10 women’s prisons. The prisons are clustered together along Highway 36 north of town; each barbed-wire fence and lookout tower is mirrored by its twin on the other side. More than 5,000 women are incarcerated here. 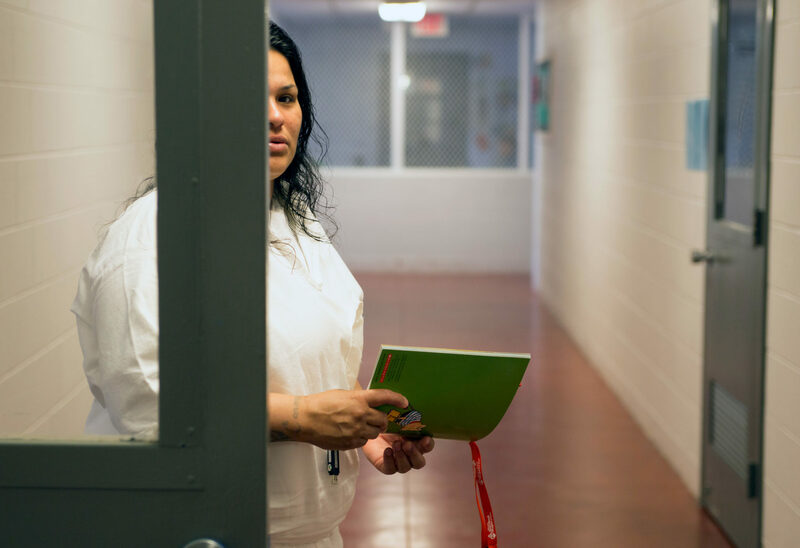 Since 2010, the number of women behind bars in the United States has been growing faster than any other incarcerated group — by 3 percent each year, according to the U.S. Department of Justice. Some 65,600 mothers are incarcerated nationwide, a 131-percent increase since 1991. The book she’s picked out for her daughter is Amelia Bedelia’s Masterpiece. Morin says that Mireya was recently bullied at school when she told a friend that her mom was in prison. “The other girl said she couldn’t be her friend anymore,” Morin says. “I just wish…” She trails off. Donna Gelfman, the volunteer helping her record, clicks off the USB recorder and hands it to Morin. The final step is to take the recorder to another room, where a volunteer will burn the audio file to a CD and give Morin the chance to write a message on the disc before packing it into a shipping envelope with the books. She smiles, thanks Gelfman, and walks off down the hall, clutching the recorder to her chest.